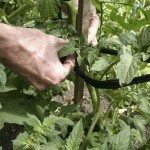 What is the best way to prune tomato plants? I have 6 plants reaching 5 feet and too many leaves. Fruit in coming slowly on the vines.